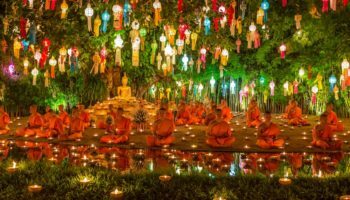 Situated in the glistening waters of the Andaman Sea, right down in the south of Thailand, the pretty province of Krabi boasts beautiful beaches, traditional culture, and plentiful island paradises to explore. With its jutting karst landscape, verdant mangroves and traditional local communities; lush and laid-back Krabi has become a popular holiday spot for travelers. 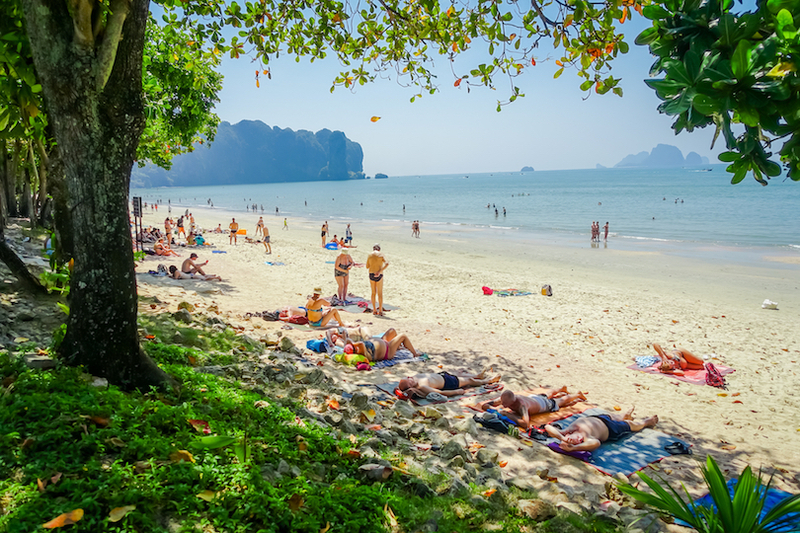 Not just for adventurous backpackers, tourism in Krabi has grown and flourished, with many mid-range and luxury hotels and resorts opening up to accommodate the growing number of visitors flocking here for a slice of tropical Thailand. Krabi’s once sleepy towns have become vibrant and busy with restaurants and late night bars, but there still remains a selection of sleepy, secluded spots where life is more about watching sunsets than partying. Affordable accommodation is plentiful here, with beach bungalows boasting brilliant views, some even with the luxury of a swimming pool. Travelling to various destinations in Krabi by local boats is normal; once there, hiring a scooter is often the cheapest and easiest way to get around. With so much to see and do in Krabi, you will never be stuck for a new adventure. All you need to do now is decide where to stay in Krabi. But be careful, once you’re here you might not be able to tear yourself away from your spot in paradise. Ao Nang is the most popular place to stay in Krabi. Travelers come for the laid-back beach life, comfortable accommodation and easy access to explore the numerous beaches along the coast. 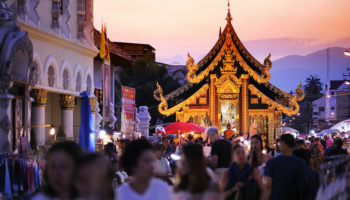 Over the years, Ao Nang has developed into a destination not just for backpackers, but also for tourists who want some time-out on a Thai beach. 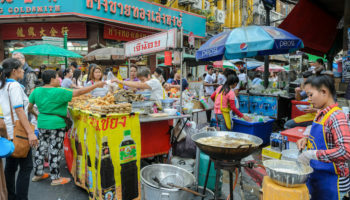 The influx of visitors to Ao Nang has brought opportunities for locals to run boat trips and open restaurants, which means there is now a huge selection of food and entertainment venues to choose from. 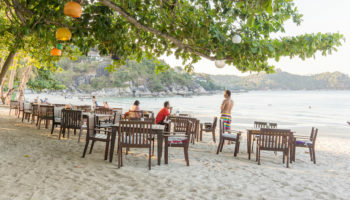 Ao Nang beach is a popping place where people sip beer in the sunshine to the backdrop of its blue shoreline and reggae music. During peak season, bungalow and hotel accommodation gets more expensive, but budget-friendly stays can still be found in the form of friendly guest houses. Centara Grand Beach Resort – Located on the private Pai Plong Bay, Centara Grand Beach Resort & Villas definitely lives up to its 5-star status. This luxurious resort offers a wide range of deluxe rooms and villas. Some have gorgeous balconies that overlook the treetops, others come complete with Jacuzzis with sea views. There’s a relaxed ambiance here, meaning that you can enjoy your holiday in a true laid-back vibe. Plus, there’s a free speedboat that runs to Nopparatthara Beach every hour. Krabi Resort – This beachside hotel has stylish rooms that include private terraces. You can spend your days here lounging around the large pool, eating delicious food in the restaurant, and looking out over the turquoise sea. This hotel is close to some great diving spots near the limestone cliffs, where you can also try out snorkeling and rock climbing. The beach and pool bar here – where you can enjoy snacks and BBQ dishes – is a chilled place to hang out during the day or night. Anyavee Ao Nang Bay Resort – Set on a hillside overlooking the beautiful Nopparatthara Beach, this 4-star offering features spacious rooms and an incredible amount of comfort in its cozy interiors. Boasting a large swimming pool complete with loungers to soak up that sun, there’s also a restaurant that serves up delicious Thai food, or just swim up to the bar and order a tasty cocktail. 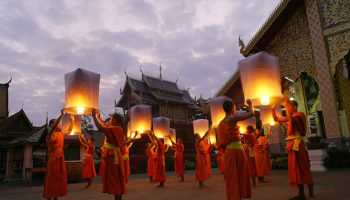 The staff are very approachable and will help you to organize trips and tours. 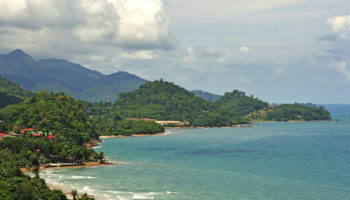 Wake Up Aonang Hotel – This budget-friendly hotel is just a stone’s throw from Aonang Beach. It’s a spotlessly clean place, and the modern rooms are decked out with simple designs; some are family rooms. Wake Up Aonang Hotel is also just a few minutes away from restaurants and shops, which is great for getting into the local area. This place also provides a handy airport shuttle, making it convenient for getting in or out of Krabi. It’s also good if you’re planning on further island hopping. The idyllic island of Phi Phi Don is located just off the coast of Krabi; set in turquoise waters with long, golden beaches. A popular spot for travelers looking to kick back in paradise, Phi Phi Don is known for its fun vibes and stunning natural landscape. Jutting karsts and typically Thai beaches have made this island an icon of island holidays, and the once under-the-radar backpacking spot has become a mainstream holiday destination. Phi Phi is now awash with a selection of affordable guesthouses and luxury hotels, plus an abundance of stylish restaurants and shops. Make the most of staying on a tropical island by trying out scuba diving, or have an adventure and hike the walking trails to discover more about the real Phi Phi Don. To the south is the smaller island of Phi-Phi Leh, made famous by the Leonardo DiCaprio movie ‘The Beach’. Though undeveloped and hotel-free you can expect plenty of tourists during daylight hours, especially in beautiful Maya Bay. Zeavola Resort – Zeavola Resort has a great location – right on an unspoiled beach within 10 acres of private resort. If you wanted a truly luxurious beach getaway, you need look no further than this 5-star resort. This place comes complete with beautiful laid back beach huts with doors that open out onto the jungle, helping to create a romantic atmosphere. Staff work hard to preserve the tranquil environment of this eco-friendly hotel. There’s a buffet breakfast and a delicious seafood restaurant onsite. Phi Phi Island Village Beach Resort – Another slice of luxury on this beautiful island, Phi Phi Island Village Beach Resort is set on a private beach. There’s a lot of fun things going on here. Some rooms come with their own private pools, there’s an infinity pool overlooking the beach (which comes with one of those fun swim-up pool bars), four restaurants, tennis courts, and a dive center. This hotel even has a childcare service to cater for those traveling with small children. Phi Phi Cliff Beach Resort – As the name might have given away, this beautiful hotel is set right on the cliffs overlooking Ton Sai Bay. Of course, this means a stunning, luxurious pool to help soak up the equally stunning views. There’s also direct access from the hotel to the beach below. The hotel itself is sleek and modern, with rooms that are all polished wooden floors, leather sofas, and big, wide windows so you can always see the incredible vistas that Phi Phi Cliff Beach Resort offers. HIP Seaview Resort – Perched on a hilltop, HIP Seaview Resort is a tranquil hotel in the Long Beach area. From up high, there are some dramatic panoramic views to be had of the surrounding landscape. In fact, you can only get here by a walk up a long set of stairs, but once you’re there, the views are worth it. There are taxi boats here that can take you anywhere you need to go – that’s if you can tear yourself away from your private balcony with its comfy seats. Ko Lanta is a big, beautiful island with many options for visitors who want to spend time kicking back on its numerous beaches. The old fishing village turned tourist town of Baan Saladan is where boats ferry travelers to neighboring islands. There’s a big choice of restaurants, shops and budget accommodation in the town, as well as easy access to transportation to other parts of the island. Further around on the peninsula, luxury resorts with Instagram-ready poolside aesthetics serve guests everything they could need on their island retreat. Head to Haad Khlong Dao if you are looking for a sizeable beach and family-friendly mid-range hotels, as well as a little more comfort and convenience. Pimalai Resort & Spa – This is a huge, impressive resort, an elegant place to stay where you’ll quite literally want for nothing. Everything is decorated with Thai fabric and locally-sourced materials – think polished teak floors and rattan. You can enjoy drinks poolside at the infinity pool, take your pick of one of the three restaurants on offer, or spend time in the spa. The beach is also right in front of the resort. SriLanta Resort – Tucked away on the west coast of Ko Lanta, this 4-star resort is beautifully designed with a modern, minimalist eye mixing in a few traditional touches. Spend your time here lapping up the heavenly views whilst you tuck into tasty dishes at one of SriLanta’s three restaurants. Then you can work off all the food at one of their yoga sessions or simply unwind with a relaxing massage. Some of the chic rooms here come complete with spa baths and private terraces. 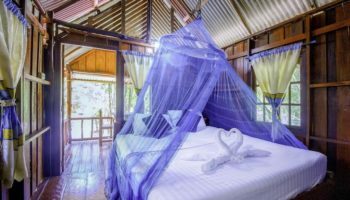 Lanta New Coconut Bungalow – Lanta New Coconut Resort is a good choice for those who want a balance between lively things to do at night (with bars and restaurants nearby) and time spent chilling out. The budget-friendly bungalows offer simple comforts, such as a hammock to snooze in. There’s a pool here, but better yet, this place is set right on Klong Khong Beach, where you can play around in the daytime and then watch the sunset – drink in hand – from the nice bar. Located on a peninsula, Railay has four picturesque beaches and a thriving activity scene. The area is famous for rock climbing; in fact, it’s said to be one of the top places in the world to try this precarious sport, with the rough mountainous landscape serving as an ideal climb, and the pay-off of panoramic views over turquoise waters and nearby islands. Hotels are more luxurious on this peninsula, offering exclusivity and comfort to many international guests. There’s a selection of budget accommodation available, but mainly inland, though this means a choice of local eateries and top sights are within easy walking distance. There’s a wide choice of mid-range accommodation, which comes in the form of villas with spas and pools. Rayavadee – With its utterly peaceful surroundings and simply breathtaking scenery of limestone mountains and jungles, Rayavadee boasts extremely chic 2-story lodges set between palm trees. The interiors here are ultra-sleek and very tastefully done. Everything is immaculately maintained at this truly 5-star offering, and staff will treat you like a VIP. There are several restaurants, all with beautiful sea views, of course – there’s even one set in a cave! 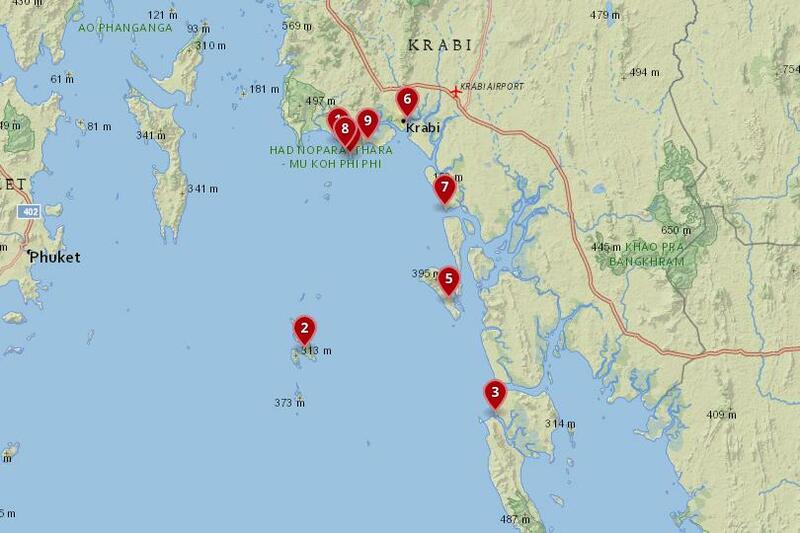 Rayavadee is located right next to Krabi Marine National Park. Railay Princess Resort & Spa – Five minutes away from Pranang Cave Beach, Railay Princess Resort & Spa boasts two outdoor swimming pools in manicured gardens for plenty of space to relax in. Rooms are modern and minimalist with traditional Thai flourishes. Work up an appetite in the gym or in the pool, then try the delicious local and Western food on offer at their restaurant. Being located near to the main pier in Railay means it’s easy to explore further afield from this hotel. Avatar Railay – A boutique style offering with a swimming pool right outside the balconies of the rooms – meaning you can literally step off your balcony into the pool – Avatar Railay has a perfect location for getting on with many activities, such as exploring the various beaches around the area, rock climbing, or visiting the amazing Princess Lagoon. The beach here is calm enough that you’ll always find space for yourself. Wake up in the morning to see monkeys swinging from the trees. Sand Sea Resort – At this 3-star hotel, you can stay in either a bungalow or a spacious suite, both complete with large beds and great amenities – some even have impressive mountain views. The location of Sand Sea Resort – set on Railay West Beach – is excellent for those who want to be close to the action on this island; Walking Street is just a two-minute stroll away. Boasting two pools – one of which is on the beach – there are plenty of sun loungers dotted around for simply soaking up the rays. 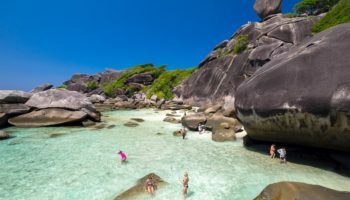 If you are looking for a friendly Thai island with relaxing sunsets and tranquil beaches, then the under-the-radar island of Ko Jum could be the spot for you. This island is home to quiet beaches, a few smatterings of tourists, and the sort of welcoming, chilled atmosphere that you’d expect from a tropical getaway. Traditional life still continues here on Ko Jum. Away from the tourist scene at Ko Lanta and Phi Phi, colorful houses scatter the coast and the luminous green of nature covers the interior, where communities live with chickens and children running freely. Much of the accommodation on Ko Jum is basic and budget-friendly; there’s a growing selection of more mid-range style hotels featuring gardens and pools which are still relatively affordable. Take the chance to explore other islands in the Anaman by catching a ride on one of the longtail boats to nearby spots. Kohjum Freedom Resort – Rustic style comfortable beach houses with sea views and big balconies is the order of the day at Kohjum Freedom Resort. If that doesn’t sound like you, why not have a little bit more of an adventure and stay at one of the cool treehouses on offer at this 3-star resort? Enjoy tasty dishes at the hotel’s open-air restaurant. The setting on peaceful Ko Jum beach means a bit more of a secluded, exclusive feeling. Many travelers pass through Krabi Town on their way to explore the surrounding islands, and this constant stream of visitors makes for a fun-filled atmosphere. Interesting bars and restaurants have opened up inside classic shophouses to the backdrop of karst mountains and mangroves. Krabi is a surprising wealthy town considering its size: it’s got a modern marina, along with cultural walks and public art that connects to the town’s history. Accommodation in Krabi Town is often excellent value for money – backpacker guesthouses and more mid-range hotels compete for customers, making for a healthy selection of choices. The Sasi House – Newly built and in a great location for soaking up local life, from The Sasi House, you can easily walk to Krabi Night Market as well as the local temple; Walking Street is also nearby. Staff at this hotel are really friendly and helpful. The rooms are clean and comfortable – some come with private bathrooms, whilst others are shared. It’s a simple offering, but great for people who like to be near lively nightlife and on a budget. Secluded Had Yao is a pretty, undeveloped beach just around the coast from Ko Lanta. The area around the beach still remains traditional; many local Muslim families are farmers and live their lives away from the tourist crowds of neighboring towns. Accommodation along the beach is basic and spacious, with views out across the long stretch of shoreline and out to sea. There is a selection of seafood restaurants that serve fresh food to visitors, or if you want something a little more familiar, the beach bungalow resorts usually have their own restaurant attached. There isn’t much in the way of entertainment in this area, but the carefree beach, great swimming conditions and relaxing atmosphere make for an easygoing beach break. Transport is easy to come by; hotel owners and locals will offer pick-up and taxi services, or you can catch the songthaew (local bus) to the pier to jump aboard a ferry. 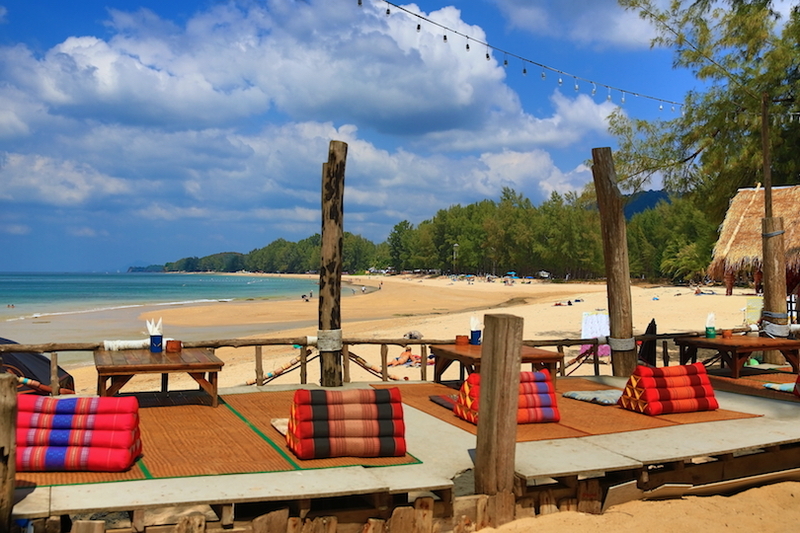 Purin Resort – Purin Resort has a quiet atmosphere and is set right on the beautiful Had Yao Beach. It’s got large rooms which are decorated in delicate natural tones, reflecting the gorgeous tropical gardens of the hotel. Some villas here come with their own pools, which is great for couples or those who feel like a little more privacy. There’s also a large pool on the beach itself – ideal for a swim before breakfast. Secluded Tonsai is a slice of beach heaven. Only accessible by boat from Ao Nang and Railay, Tonsai is part of the mainland but remains a hidden gem in the Krabi tourist scene. Think huge cliffs, beautiful beaches and lush jungles; Tonsai is a peaceful Thai Eden. Don’t expect to get phone reception, let alone internet connection, and there isn’t much to do here other than to kick back and slip effortlessly into beach life. Rock climbing is a big draw to this area, as the beach is surrounded by huge cliffs. Or you could arrange for a boat to take you to other islands. Tonsai’s tight-knit local community is small and welcoming, and accommodation is clean and budget-friendly; a handful of resorts have opened here in recent years, which offer more mid-range amenities. Tonsai Bay Resort – Boasting a restaurant right on the beach, this place feels secluded and private with its bungalows dotted around a jungle setting. The rooms are simple but come with a number of facilities: you can make your own tea and coffee, there are mini fridges, terraces, satellite TV and nicely carved design touches. Activities on offer here include rock climbing and a dive school. The feeling of privacy is heightened since the only way to reach Tonsai Bay Resort is via longboat (or a ferry from Phi Phi Island)! The magnificent Ao Nam Mao beach is popular with day-trippers arriving by boat from nearby resorts to spend the day on the beach and see the fossils that the beach is famous for. The area hasn’t seen as much development as other resorts in Krabi, and once the day visitors disperse, returns to its blissful atmosphere. There are a few residential houses and local shops that dot the main road, and a bus connection that runs to Ao Nang, but other than that Ao Nam Mao is the place to stay if you want to just chill out and do nothing. Accommodation in Ao Nam is a step above backpacker beach huts and leans more towards affordable mid-range beach resorts with swimming pools and on-site restaurants, which are often family-friendly. 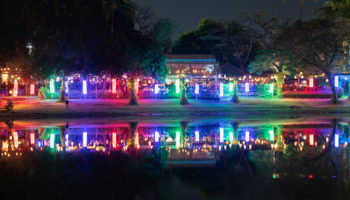 Arawan Krabi Beach Resort – A laid-back beach resort set amongst luscious rainforest, Arawan Krabi Beach Resort is just an 18-minute walk from Ao Nammao Pier. This 3-star offering also features a restaurant and two pools, both of which feature the luxury of pool bars. This place features chilled, nicely decorated rooms, some of which boast private balconies and gorgeous sea views that will make it feel like they’re all for you. Suites take it up a notch with private plunge pools.